Using PDFfiller, you can convert any PDF document to the Word, Excel or PowerPoint format or save it as a PDF with different properties. Quite often we need to use word processing software to edit and customize our PDF documents before converting them back to the PDF format. When you’ve finished editing a PDF document in PDFfiller’s editor, you can convert it to the .docx format. Click Done and select Save As. Click on the Word icon. If you need to make any calculations using figures contained in a PDF document, you can convert it to an Excel spreadsheet. Using our online PDF converter, you can save yourself a lot of time because you don’t have to create huge tables and manually populate them with numbers. While your PDF document is still open in the editor, click Done and select Save As. Then, select the Excel icon. Open the document with any program supporting the .xlsx format and make any calculations you need. Sometimes we need to make PowerPoint presentations using information contained in PDF files. In this situation, PDFfiller’s online PDF converter can be very helpful. To convert your PDF file to .pptx format click Done and select Save As while the document is open in the editor. Then, select the PowerPoint icon. You can download any PDF document to your local drive. After you’ve finished editing the document, click Done and select Save As. Then, click on the PDF icon. In the window that will open next, select the pages you need to save. In the next dialog box, enter a password and press the Apply button. If you want to save your document as an image PDF, select the respective option in the Settings dialog window. You will be able to change the orientation of pages, paper size and quality of the document. If you like being able to use our online PDF converter, you might be interested in a whole lot of other great features that PDFfiller has to offer. Some of these include creating templates, making copies of documents, editing, filling, annotating, signing and sharing documents. Check out these tutorials to see the other great things that PDFfiller can do for you! To use online PDF converter, upload your document to PDFfiller. PDFfiller online editor instantly converts any PDF document to a fillable format online. You can edit your PDF with our various tools and features. To fill the form with text, choose the 'Text' button and start typing. To sign your fillable form, click the 'Signature' or 'Picture' buttons to sign your document or insert an image. To create a fillable PDF form, click the 'Add Fillable Fields' tabs on the right and add fillable fields for text, signatures, images or more. How to convert PDF to a fillable document? To convert PDF to fillable, upload your document to PDFfiller. PDFfiller can instantly convert any PDF document to a fillable format online. Edit your document with our various tools and features. Click the ‘Text’ button and start typing to fill your document with text. To further create a fillable document, click the 'Add Fillable Fields' tabs on the right and add fillable fields for text, signatures, images or more. How to convert PDF to editable Word? To convert PDF to Word, upload your document to PDFfiller. PDFfiller can instantly convert any PDF document to an editable format online. Edit your document with our various tools and features. When you're done with editing, click the 'Done' button and convert your PDF as a Word document. Can I convert PDF to a fillable form? Of course you can. 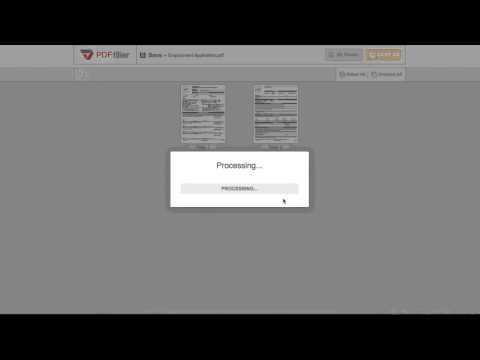 To convert a PDF to a fillable form, upload your form to PDFfiller. PDFfiller can instantly convert any PDF document to a fillable format online. Choose the 'Text' button and start typing. You can place text by moving the text box. Click the 'Signature' or 'Picture' buttons to sign your document or insert an image. You can also add sticky notes, comments or text boxes to any PDF file. You can also create fillable fields by clicking ‘Add Fillable Fields’ tab on the right.